FREE for a limited time – Spelling Test by FunExam.com, a cool tool for improving spelling test scores. To use this app you must create a free account by submitting your email and a password. Then you can begin creating your tests. First you name your test – short a words, days of the week, first grade/week 1, sight words/list 1, etc. I would make the name match the lesson so that your data is more meaningful. Then you type in the words – the app is case-sensitive. If you enter a proper noun, the app is going to mark it wrong without a capital letter. 🙂 Then you record the words. The app gives you enough time to also include the words’ meanings or sentences using the words – perfect for homonyms. That’s it – easy!! Once your test has been created, kids can practice. They simply click on the test they would like to take. The words are pronounced and the kids spell them by typing them in. The app grades the test as you go – correct words are shown in green, incorrect words in red. The correct spelling of each word is also shown. When the test is complete, the final score is shown in two ways – 5/7 and 71%. 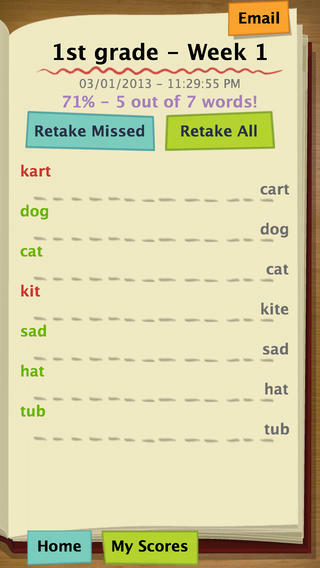 Kids are given the option of retaking the missed words or retaking all of the words. The results can be emailed. This app is fantastic – easy to use and it tracks progress. Kids would love creating their own test at the beginning of the week. Teachers could use it for phonics lessons, to teach homonyms, and more. Older students could us this app for science vocabulary, to learn foreign language words, etc. There are lots of applications (beyond spelling) for this app. Just use a bit of imagination – LOVE it! !